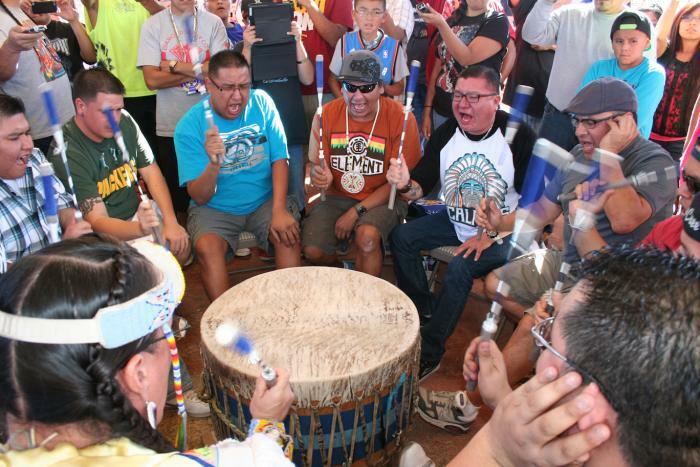 Drums, flutes and rattles are the three most common instruments used by Native American tribes. The most important of these was and still is the drum. Go to any powwow or Indian event and there will be drumming. Different tribes have different traditions about the drum and how to play it, but the basic construction is very similar in most tribes: a wooden frame or a carved and hollowed-out log, with finely tanned buckskin or elkskin stretched taut across the opening by a sinew thong. Other hides were sometimes used - I have seen a bear skin drumhead and now some "Indian drums" use cowhide for the drumhead. Other drum types include two basic styles of water drums: the Iroquois type and the Yaqui type. The Iroquois water drum is a small cup-shaped wooden vessel, with water inside it, and a moistened tanned hide stretched across the top opening; the amount of water inside as well as the wetness and tightness of the tanned hide produce changes in pitch and volume. The Yaqui type of water drum is actually a half gourd, large in size, that floats in a tub of water like a bubble on the surface; the outer round surface of the gourd is struck with a drum stick, and the vibrations are amplified using the tub of water as a resonator. Another type of drum called a foot drum is no longer used or made but has been found in several southwestern and central-Californian US Native American archaeological sites inhabited, or formally inhabited, by the Miwok, Maidu, Aztec, and Hopi Indian tribes. These drums were often semicircle cross-sectioned hollow logs laid over wood covered 'resonating' pits positioned according to custom in kivas or dance houses. The foot drums were played by stomping on top of the hollow log with the structure's poles used for steadying. I have provided links for you to listen and for some links view Native American music. If you find time to listen to only one of these, I suggest it be Water Song by the Akwesasne Women Singers further described below. There are many other songs and videos of Native American music on the internet. But please note that most of what pops up when you search for Native American music (or Indian drum music or flute music) is NOT Native ... rather it is "New Age" and the artists, the beats and the instruments are often not really Native American either. Digging through the long lists of music to find authentic artists is worth it tho! And there are many great artists whose work just hasn't been posted, Rolfe Richter, a Passamaquoddy flute player is one of the best flute composers - his songs including ones to whale, moose (mus) and chickadee are my favorite Native flute songs. 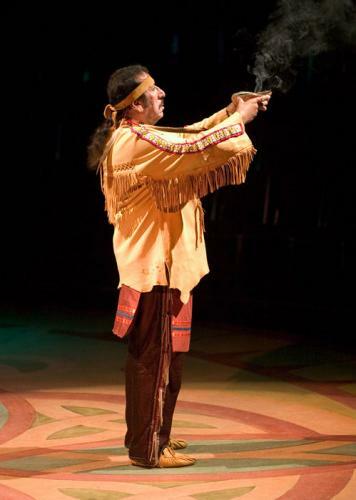 Other Native American musicians including Hubert Francis pictured above and link to some of his work provided below, have several songs and albums. Hubert's band is "Eagle Feather" and it has won several Canadian awards for it's music. The Iroquois water drum described above is my favorite personal drum. Here in the Water Song by the Akwesasne Women Singers the water drum is used in conjunction with several cow horn rattles. Akewesasne is a place on the Mohawk reserve in Quebec, Canada. The water drum pictured is made by Paul St John, a New York state Mohawk. Native American Flutes are end blown flutes and were first made from bones, now they are made from various woods and also, tho rarely, from pottery. The soft woods are generally preferred by most flute players, because of the softer tones produced by the cedar, juniper or red wood wood. Other harder woods such as walnut and cherry are appreciated for the clear, crisp, richness of sound that they can produce. Bamboo and river cane can contain either soft or clear, crisp tones depending on size and species. I have seen Hopi, Santa Clara and Tesque pottery flutes, likely other Southwest Pueblo cultures made pottery flutes as well. View and listen to the Lakota Sioux "Elks Courting" song played by Scott With Horn, from the Crow Creek Reservation in Fort Thompson, South Dakota. And here is R. Carlos Nakai, Navajo - the best known Native American flute player and composer improvising "Changes" and "Canyon Triology"
Rattles were used by Native Americans primarily for music - for dancing or singing. Sometimes rattles were used by shamans for ceremonial purposes. Rattles were made of many types of hollow container that were filled with beads, seeds, or pebbles with a handle inserted into one end. Among other things a container rattle may be made of: hollow gourds, turtle shells, shaped and dried rawhide, and buffalo, cow or other horn. Rattles can be plain or painted, colored, or decorated in a variety of ways depending upon individual preferences or what purpose the rattle will serve. To hear an Iroquois cow horn rattle, please listen to the Water Song by the Akwesasne Women Singers - this is mentioned above in reference to the water drum, click the link there. Other instruments, not common, include rasps and stringed instruments; usually 2 stringed of rawhide strings attached to bone or wood. Hubert Francis, Mig'mag (US spelling Micmac) - one of the stars of the Canadian Music review, DRUM! : 4 cultures, 4 rhythms of Nova Scotia. Aboriginal, Black, Celtic and Acadian – brought together in a heart-pumping fusion of music, dance, poetry, video, rhythm, and song". See an 8 minute preview of DRUM! showing Hubert describing his culture's place in the changing social environment.